Dan and Bobbie Jo are a traditional husband-and-wife couple where Dan hunts for wild game and Bobbie Jo cooks what he brings home. But unlike the stereotypical hand-off at the pot on the stove, Bobbie Jo will often go into the field with Dan and he will often help Bobbie Jo in the kitchen. This way they support each other and share both the harvest and the preparation of these nutritious and natural wild meats that are the ultimate achievement of the hunt. Based in northern California with roots in Pennsylvania, they show how couples can work together to be successful both in the field and in the kitchen. Dan has been hunting since he was 12 and has learned techniques for the hunt itself and for caring for wild game to make the most flavorful cuts for Bobbie’s kitchen. In his “He Hunts” blog, he discusses the realities of the hunts and provide insights to methods and even traditions that make each hunt special. Like most hunters, Dan has a full-time job and hunts recreationally on weekends and during precious vacation time, so he typically will be seeking meat instead of trophy animals each time in the field. Bobbie Jo is a naturally talented chef who began to specialize in preparing wild game shortly after she and Dan were married. Bobbie Jo has taken this passion for cooking wild game and created a personal chef business called “Cookin’ Wild™” where she provides multi-course, wild game meals for clients in northern California. In Bobbie Jo’s “She Cooks” blog, she provides recipes and background information on how best to prepare many different types of wild game and even exotic meats and seafood. 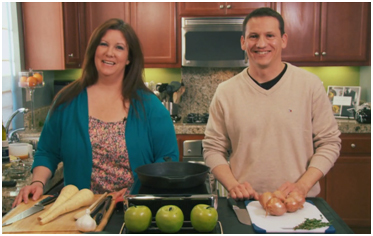 Dan and Bobbie Jo are currently working on a television show called “He Hunts She Cooks™” where their collaboration for hunting and cooking is brought to life in an exciting and entertaining television series. Contact Dan at dan@hehuntsshecooks.com for the latest media package and a secure link to the full pilot episode. He Hunts She Cooks™ pilot episode filmed and edited by BA Productions.